False color images of the growth of crystalline germanium-telluride (yellow) into amorphous germanium-telluride (blue) in a series of 17.5-nanosecond electron images during crystallization induced by a 12-nanosecond laser pulse. The time signature in each frame is relative to the peak laser intensity on the specimen. (Phys.org) —Lawrence Livermore researchers for the first time have created movies of irreversible reactions that occur too rapidly to capture with conventional microscopy. 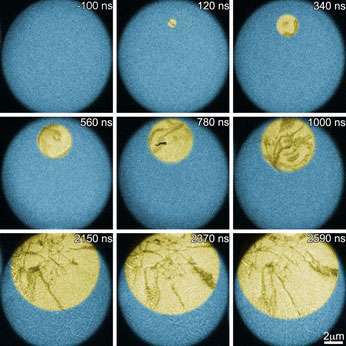 The team used multi-frame, nanosecond-scale imaging in the dynamic transmission electron microscope (DTEM) to create movies of the crystallization of phase change materials used for optical and resistive memory. A phase-change material (PCM) is a substance that can be switched between an amorphous and a crystalline state with rapid heating. Optical memory (compact discs and DVDs) and non-volatile Random Access Memory (RAM) use the distinct optical and electrical properties of the amorphous and crystalline phases of PCMs. For memory applications, it is necessary to switch between the amorphous and crystalline phases in nanoseconds by rapid heating. Heating may be achieved by laser- or current-pulses, but in either case, crystallization of the amorphous phase is the slower, data-rate-limiting process compared to the melt-quench process that switches the PCM from crystalline to amorphous. A solid understanding of crystallization kinetics during laser and resistive heating, where heating rates may exceed 10 trillion degrees Celsius per second and crystal growth rates approach their maximum, is extremely important because they directly impact device speed. "We recorded movies of laser-induced crystallization and measured crystal growth rates at temperatures close to where the maximum growth rate occurs," said Melissa Santala, lead author in the May 3 edition of the journal, Applied Physics Letters. "This paves the way for studying crystallization kinetics of phase change materials over the whole range of technologically relevant temperatures." Dynamic processes such as laser- or current-induced crystallization are orders of magnitude too fast to capture with other imaging techniques. The development of pulsed photo-emission transmission electron microscopy (TEM) techniques with high temporal resolution has enabled the study of processes occurring on the microsecond to femtosecond scale. To examine irreversible reactions important in materials science, the "single-shot" technique is required, where a very short, high-current electron pulse is used to probe a reacting material on the nanosecond scale. The team used the single-shot DTEM at Lawrence Livermore that has been re-designed, by Thomas LaGrange and Bryan Reed, to generate multiple nanosecond electron pulses spaced over several microseconds, which probe a specimen multiple times during a single initiated reaction, forming a movie of a unique irreversible reaction. The movie captured the crystallization of germanium telluride (GeTe), a semiconductor that is used in a wide range of applications. "DTEM experiments are valuable for the evaluation of PCM alloys in the technologically relevant temperature regime, but further opportunities exist to build a more complete understanding of crystallization kinetics of GeTe and other PCMs." Santala said. The movies allowed researchers to analyze the direct measurement of crystal growth rates at the high temperatures and short times especially relevant to the function of PCM memory devices. The team includes another Livermore scientist, Geoffrey Campbell, as well as two scientists from IBM. The research was funded by the Department of Energy, Office of Science, Office of Basic Energy Sciences (BES), Division of Materials Sciences and Engineering.